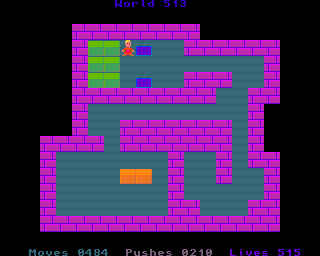 World five hundred and thirteen is easy puzzle with long corridors that is slow to complete. Go DOWN, RIGHT, RIGHT, RIGHT, UP, UP, UP, LEFT, LEFT, LEFT, UP, UP, UP, RIGHT, RIGHT, RIGHT, RIGHT, RIGHT, RIGHT, RIGHT, RIGHT, DOWN, DOWN, DOWN, DOWN, DOWN, LEFT, LEFT, LEFT, UP, UP, RIGHT, push DOWN, go LEFT, DOWN, push RIGHT, RIGHT, go DOWN, RIGHT, push UP, UP, UP, UP, UP, UP, UP, UP, go RIGHT, UP, push LEFT, LEFT, LEFT, LEFT, LEFT, LEFT, LEFT, LEFT, LEFT, go UP, LEFT and push DOWN. Go RIGHT, RIGHT, RIGHT, RIGHT, RIGHT, RIGHT, RIGHT, RIGHT, RIGHT, DOWN, DOWN, DOWN, LEFT, LEFT, LEFT, LEFT, LEFT, LEFT, LEFT, LEFT, DOWN, DOWN, DOWN, RIGHT, RIGHT, RIGHT, DOWN, DOWN, DOWN, LEFT, LEFT, LEFT, UP, push UP, UP, UP, UP, go LEFT, UP, push RIGHT, RIGHT, RIGHT, RIGHT, RIGHT, RIGHT, RIGHT, RIGHT, go UP, RIGHT, push DOWN, DOWN, DOWN, DOWN, DOWN, go RIGHT, DOWN, push LEFT, go DOWN, LEFT, LEFT, UP, push RIGHT, go DOWN, RIGHT, push UP, UP, UP, UP, UP, UP, UP, UP, go RIGHT, UP, push LEFT, LEFT, LEFT, LEFT, LEFT, LEFT, LEFT, LEFT, go UP, LEFT and push DOWN. Go RIGHT, RIGHT, RIGHT, RIGHT, RIGHT, RIGHT, RIGHT, RIGHT, DOWN, DOWN, LEFT, DOWN, LEFT, LEFT, LEFT, LEFT, LEFT, LEFT, LEFT, DOWN, DOWN, DOWN, DOWN, DOWN, RIGHT, DOWN, RIGHT, RIGHT, UP, push LEFT, LEFT, go DOWN, LEFT, push UP, UP, UP, UP and UP. Go LEFT, UP, push RIGHT, RIGHT, RIGHT, RIGHT, RIGHT, RIGHT, RIGHT, RIGHT, go UP, RIGHT, push DOWN, DOWN, DOWN, DOWN, DOWN, go RIGHT, DOWN and push LEFT. Go DOWN, LEFT, LEFT, UP, push RIGHT, go DOWN, RIGHT, push UP, UP, UP, UP, UP, UP, UP, UP, go RIGHT, UP, push LEFT, LEFT, LEFT, LEFT, LEFT, LEFT, LEFT, LEFT and LEFT. Go RIGHT, RIGHT, RIGHT, RIGHT, RIGHT, RIGHT, RIGHT, RIGHT, DOWN, DOWN, LEFT, DOWN, LEFT, LEFT, LEFT, LEFT, LEFT, LEFT, LEFT, DOWN, DOWN, DOWN, LEFT, LEFT, LEFT, DOWN, DOWN, push RIGHT, RIGHT, go DOWN, RIGHT, push UP, UP, UP, UP, UP, go LEFT, UP, push RIGHT, RIGHT, RIGHT, RIGHT, RIGHT, RIGHT, RIGHT, RIGHT, go UP, RIGHT, push DOWN, DOWN, DOWN, DOWN, DOWN, go RIGHT, DOWN and push LEFT. Go DOWN, LEFT, LEFT, UP, push RIGHT, go DOWN, RIGHT, push UP, UP, UP, UP, UP, UP, UP, UP, go RIGHT, UP, push LEFT, LEFT, LEFT, LEFT, LEFT, LEFT, LEFT, go DOWN, LEFT, push UP, go RIGHT, UP, push LEFT and LEFT. Go RIGHT, RIGHT, DOWN, RIGHT, RIGHT, RIGHT, RIGHT, RIGHT, RIGHT, DOWN, DOWN, LEFT, DOWN, LEFT, LEFT, LEFT, LEFT, LEFT, LEFT, LEFT, DOWN, DOWN, DOWN, DOWN, DOWN, LEFT and push UP. Go DOWN, LEFT, LEFT, UP, UP, RIGHT, push RIGHT, go DOWN, RIGHT, push UP, UP, UP, go LEFT, UP, push RIGHT, RIGHT, RIGHT, RIGHT, RIGHT, RIGHT, RIGHT, RIGHT, go UP, RIGHT, push DOWN, DOWN, DOWN, DOWN, DOWN, go RIGHT, DOWN and push LEFT. Go DOWN, LEFT, LEFT, UP, push RIGHT, go DOWN, RIGHT, push UP, UP, UP, UP, UP, UP, UP, UP, go RIGHT, UP, push LEFT, LEFT, LEFT, LEFT, LEFT, LEFT, LEFT and LEFT. Go RIGHT, RIGHT, RIGHT, RIGHT, RIGHT, RIGHT, RIGHT, DOWN, DOWN, DOWN, LEFT, LEFT, LEFT, LEFT, LEFT, LEFT, LEFT, LEFT, DOWN, DOWN, DOWN, LEFT, LEFT, LEFT, DOWN, push RIGHT, RIGHT, go DOWN, RIGHT, push UP, UP, UP, UP, go LEFT, UP, push RIGHT, RIGHT, RIGHT, RIGHT, RIGHT, RIGHT, RIGHT, RIGHT, go UP, RIGHT, push DOWN, DOWN, DOWN, DOWN, DOWN, go RIGHT, DOWN and push LEFT. Go DOWN, LEFT, LEFT, UP, push RIGHT, go DOWN, RIGHT, push UP, UP, UP, UP, UP, UP, UP, UP, go RIGHT, UP, push LEFT, LEFT, LEFT, LEFT, LEFT, LEFT, LEFT, go DOWN, LEFT, push UP, go RIGHT, UP and push LEFT. Go RIGHT, DOWN, RIGHT, RIGHT, RIGHT, RIGHT, RIGHT, RIGHT, DOWN, DOWN, LEFT, DOWN, LEFT, LEFT, LEFT, LEFT, LEFT, LEFT, LEFT, DOWN, DOWN, DOWN, DOWN, DOWN, RIGHT and push UP. Go DOWN, RIGHT, RIGHT, UP, push LEFT, LEFT, go DOWN, LEFT, push UP, UP, UP, UP, go LEFT, UP, push RIGHT, RIGHT, RIGHT, RIGHT, RIGHT, RIGHT, RIGHT, RIGHT, go UP, RIGHT, push DOWN, DOWN, DOWN, DOWN, DOWN, go RIGHT, DOWN, push LEFT, go DOWN, LEFT, LEFT, UP, push RIGHT, go DOWN, RIGHT, push UP, UP, UP, UP, UP, UP, UP, UP, go RIGHT, UP, push LEFT, LEFT, LEFT, LEFT, LEFT, LEFT, go UP, LEFT and push DOWN. Go RIGHT, RIGHT, RIGHT, RIGHT, RIGHT, RIGHT, DOWN, DOWN, DOWN, LEFT, LEFT, LEFT, LEFT, LEFT, LEFT, LEFT, LEFT, DOWN, DOWN, DOWN, DOWN, RIGHT, RIGHT, UP, push LEFT, go DOWN, LEFT, push UP, UP, UP, go LEFT, UP, push RIGHT, RIGHT, RIGHT, RIGHT, RIGHT, RIGHT, RIGHT, RIGHT, go UP, RIGHT, push DOWN, DOWN, DOWN, DOWN, DOWN, go RIGHT, DOWN and push LEFT. Go DOWN, LEFT, LEFT, UP, push RIGHT, go DOWN, RIGHT, push UP, UP, UP, UP, UP, UP, UP, UP, go RIGHT, UP, push LEFT, LEFT, LEFT, LEFT, LEFT, go DOWN, LEFT, push UP, go RIGHT, UP and push LEFT. Congratulations. 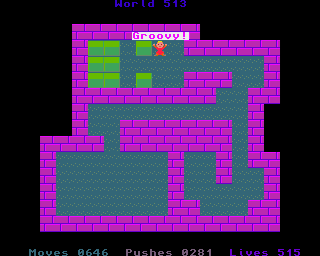 You have completed world five hundred and thirteen. Get ready for world five hundred and fourteen.